What I can’t understand is, if the American Right Wing were correct that George W. Bush was ‘right’ in trying to kick start democracy in the Middle East by invading and occupying it, then why would it be necessary for people to demonstrate and burn government buildings in… Iraq? And why have 5 people been shot down for demonstrating in two days in Iraq, as many as in the repressive monarchy of Bahrain? 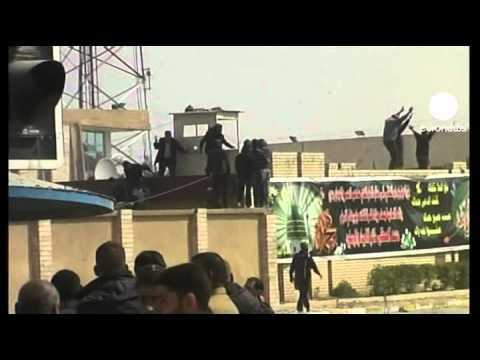 Iraqis have been demonstrating against the al-Maliki government and lack of services for two weeks now. But on Thursday, a wave of rallies swept the country from north to south, leaving two dead in Sulaimaniya and government buildings torched elsewhere. Al-Hayat reports in Arabic that in the city of Kut in Shiite south Iraq (the capital of Wasit province), crowds threatened the provincial headquarters. This action came a day after they had burned down the provincial council building and saw 3 protesters killed by security forces. The Iraqi parliament set a discussion of the protests for Saturday, while Prime Minister Nuri al-Maliki warned that unnamed sinister forces were attempting to divert the legitimate demands of the people to unstated nefarious purposes. In Kut on Thursday, dozens of demonstrators gathered in front of the mansion of the governor of Wasit Province, demanding the removal of the local governor. They demanded better government services, an end to administrative corruption (constant demands for bribes by provincial officials to do their jobs), accountability for the corrupt, and jobs. On Wednesday, police had shot dead three protesters and wounded more in Kut after they had set fire to a government building. On Thursday, in the town of Nasar in Dhi Qar province, 490 km south of Baghdad, police chief Sabah al-Fatlawi said that a curfew had been implemented after government buildings were burned. Also on Thursday, some 600 demonstrators in the southern port city of Basra in Iraq rallied in front of the provincial governor’s mansion, demanding his resignation over failure to provide basic services. They were pushed back by police. Al-Hayat says that medical officials announced that two persons had been killed and more than 30 wounded in Sulaimaniya when a crowd of some 3000 came out to demand that the Kurdistan Regional Government address problems of unemployment and undertake to improve the situation in the region. The demonstration was sponsored by “The Network for Safeguarding Rights and Liberties,” which was protesting the authoritarian rule of the two Establishment Kurdish parties that make up the Kurdistan Alliance. Iraqi political parties are patronage machines that leave non-members on the outside and sometimes destitute. They demanded a change in government and an end to corruption. On Monday, Shiite clerical leader Muqtada al-Sadr had called for peaceful demonstrations against what he called the continued American occupation of Iraq. Sadrists have probably been key to the demonstrations in the southern Iraqi cities.